This year, we’re celebrating the seventh anniversary of our online shop. Displaying the creations of various craftspeople and selling their creations has been a fun and very satisfying experience for us. We’ve met so many wonderful vendors whom we will always cherish for their talent and generosity of spirit. 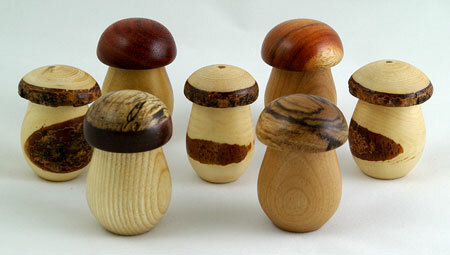 Likewise, we’ve bonded with a number of customers who have come back to us year after year for mushroom themed products. It’s been rewarding to get to know you and to help enrich your mushroom world. Nonetheless, paraphrasing Geoffrey Chaucer (who is reported to have coined the expression that “All Good Things Must Come to an End”), we must inform you that we will be closing our gift shop at the end of this year. Our lives have changed significantly over the last seven years as we know that yours have too. We can no longer dedicate the time needed to maintain a quality line of products, and have decided to remove the gift shop link from our website. You may have noticed that several of the products have already been removed. Others have limited availability. We’ll continue to make those items available online until all the variations of the product are removed from stock. If there are any goods that you might wish to purchase in bulk, please send an e-mail to MadAboutMushrooms@gmail.com, and we may be able to offer you a substantial discount on our remaining stock. The online gift shop may be winding down, but you can be assured that we’ll continue to enhance the rest of the website, posting news and information as it becomes available. However, as shopkeepers, we'll soon be bidding you a fond farewell and offering our sincere thanks for your loyalty and support over the past seven years. Happy Mushrooming to you! 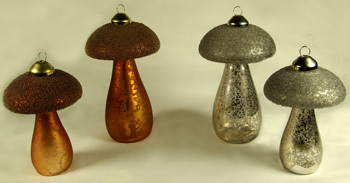 Elegant and statuesque: that's how we describe these copper and silver-tone glass mushroom ornaments. The small version is 3.75" in length and the tall is 5" in length. The stems are crackle-finished, while the caps are drenched with glitter. Whatever size you select, you're sure to feel they're a delightful addition to your celebration. The small ornaments are offered at $7.00 each and the large ornaments are $8.00 each. Or, select a set of a small and large ornament for $13.00. 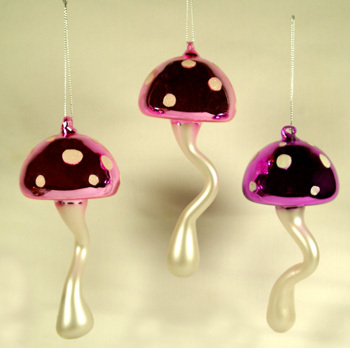 We love these fanciful dancing mushroom glass ornaments! They've been a big seller for us with only two of the original colors remaining in stock: blue/green and pink. Measuring 5.5" in length, either color will add a cheerful note wherever and whenever you decide to hang it. Their design makes them move and appear to 'dance' with the slightest air current. These treasures are very affordable at $7.00 each. Please specify your preferred color choice. 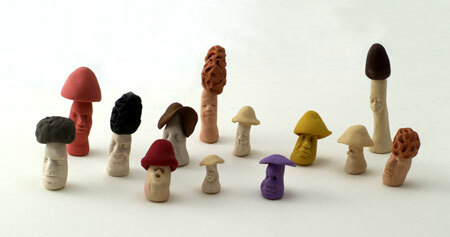 When we first saw these morel models, we did a double-take... they're that realistic. But don't try to pop these in the pan with a bit of garlic, butter and white wine; they're strictly for show. Made by a very clever and talented artisan in the Northeastern U.S. from bread dough (of all things! ), they must be kept dry. That small limitation excepted, these lovely little decorations can be used in a multitude of ways, including in plant and dinner table displays. 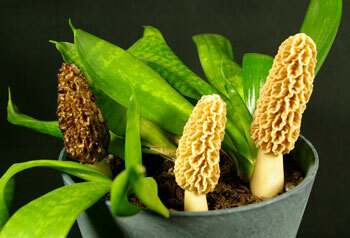 2 Inch Blond Morel - $4.00, Shipping and Handling $2.00. 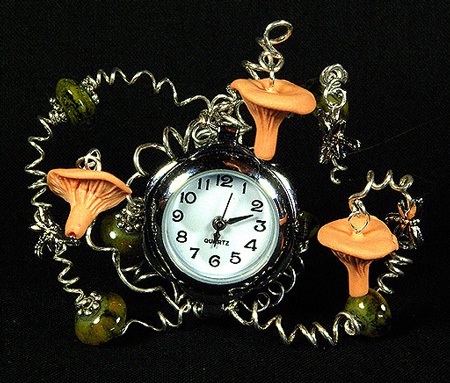 Mushroom Desk Clocks - Tempus Fungus? 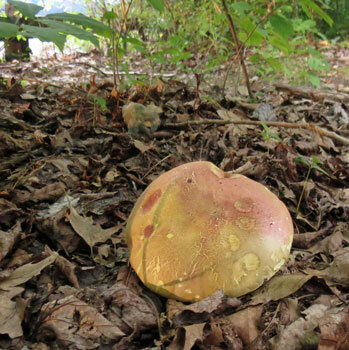 All wild mushroomers know how quickly time passes when on a foray in the woods (Tempus fungus?). 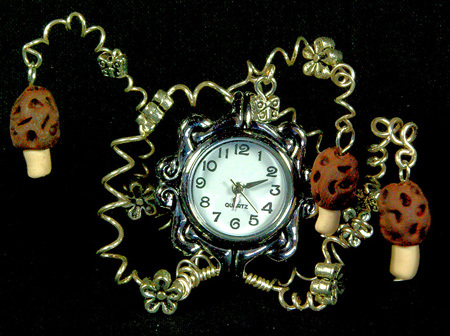 These delightful, exquisite little clocks will remind you, or the fortunate person to whom you give one, of this all year long. Perfect for a desk, night stand, dresser or vanity, the frameworks are made from Silver plated wire and decorated with little mushrooms, in your choice of Amanitas, Morels, or Chanterelles. 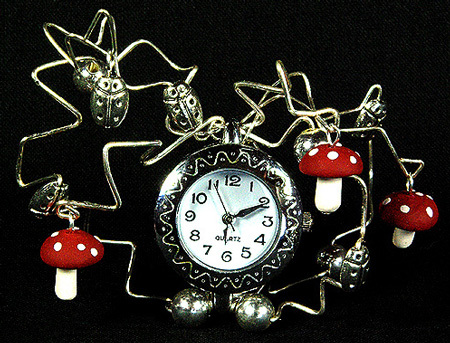 Amanita Clock - $30.00/each, Shipping & Handling $3.99. Our Button Mushroom Print Fabric is an appealing collection of marketplace button mushrooms captured in warm browns and creamy tones on 45" wide cotton fabric. The specimens look so fresh and tempting you may start to believe that you spent the day gathering them in grassy fields or gardens or along secluded pathways. We think this lovely pattern would be perfect made into tea towels, table runners, and even a shower curtain. Let your imagination run naturally wild! 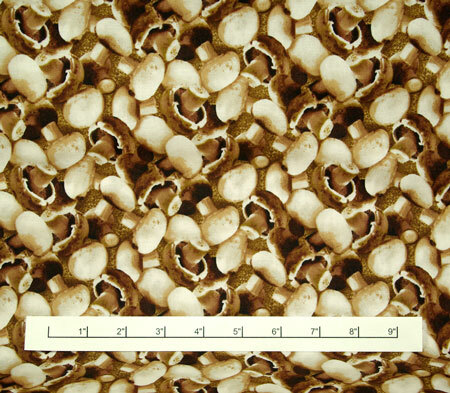 Button Mushroom Print Fabric - $10.00/yard, Shipping and Handling $2.00/yard. Just the finishing touch for any fungal feast, these generously-sized dinner napkins are handmade by local seamstresses and are available in any of our mushroom print fabrics. 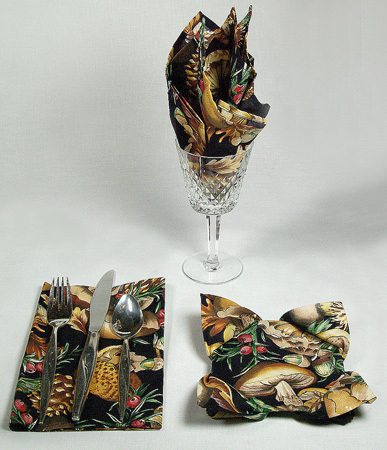 Whether folded conventionally, lotus blossom style, or arranged in a wine glass, our mushroom napkins will provide a fancy and festive look to any table! 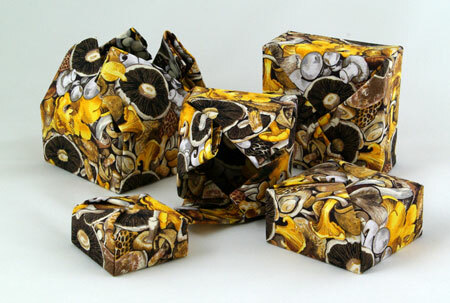 The photograph shows napkins made from our Vintage Mushroom Print Fabric which, unfortunately, is no longer available. 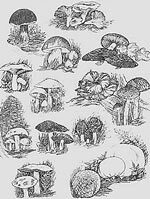 However, you are welcome to select the button mushroom print which is our only remaining fabric for your napkins. Button Mushroom Print Napkins, set of 4 - $20.00 set, includes Shipping and Handling. What gourmet mushroom chef - male or female - wouldn't be thrilled to own this handsome, full-size apron? Handmade by local seamstresses, our aprons are 28 inches wide and 28 inches top to bottom, with 3 generous 8 inch deep pockets along the bottom. Please note that since they are handmade, the sizes are approximate and may vary slightly. Special sizes may be ordered - please contact us. 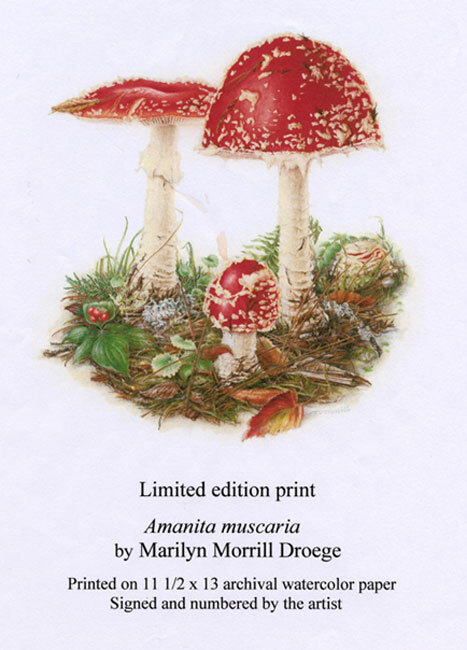 Unfortunately, the vintage mushroom print shown above is no longer available. However, you are welcome to select the button mushroom fabric (our only remaining fabric) for your apron. 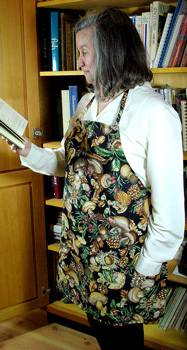 Button Mushroom Print Apron - $25.00 each, includes Shipping and Handling. Port Orford Cedar naturally occurs only on the southern Oregon coast, and from the mid-1850's on, it was much in demand, not only for its beautiful, white cedar grain and its disease resistance (bugs don't like it, unlike people) but for its unique fragrance. 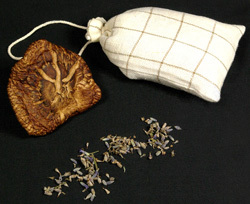 We've packed our sachet with shavings of this rare and uniquely aromatic wood, blended with organic lavender buds and the powder from seven varieties of of dehydrated wild mushrooms (matsutake, oysters, chanterelle, boletus, coral and cauliflower), for hanging in drawers, closets or anywhere there's a desire for a clean, fresh fragrance. Available in our antique linen fabric (shown above; pattern may vary due to availability) or our vintage Joan Messmore mushroom print fabric. Sachet in Antique Linen Fabric - $10.00 includes Shipping and Handling. Sachet in Vintage Mushroom Print Fabric - $10 includes Shipping and Handling. Most people still prefer the economy and ease of a bar soap for the bath or shower, so we offer the powders from our unique blend of 7 species of wild mushrooms (matsutake, oysters, chanterelle, boletus, coral and cauliflower) in three different bar soap bases, something to suit every individual preference. Castile Bar Soap - an old-time, traditional soap base, which we've updated with extra-virgin olive oil. $8.00/bar includes Shipping & Handling. Goat's Milk Bar Soap - a long-time country favorite contains a rich, creamy goat's milk base. $8.00/bar includes Shipping & Handling. Glycerin Bar Soap - one of the purest and most natural forms of soap. $8.00/bar includes Shipping & Handling. Guest Soaps: Last but not least, we mold our castile soap (with our special blend of mushroom powders) into small, guest-size portions in two different leaf patterns. Set of 10 soaps - $8.00 includes Shipping & Handling. When orders are placed for a specific mushroom as shown in the photograph above, we'll try our best to ship that particular one. However, if that one is no longer available, we'll let you know and then get your approval for a substitute. “Tis the season,” these mini-wreaths seem to sing, festively adorned with the same tiny mushrooms as go into the earrings, above. These are perfect for a holiday flower arrangement or display, or perhaps decorating a package for that very special mushroomer on your list. Approximately 5-1/2” diameter, made of durable (though artificial!) materials. 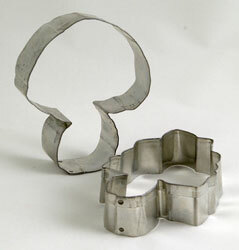 These simple cookie cutters solve that age-old dilemma, “How to make a cookie look like a mushroom?” They can also be used for biscuits or a variety of other foods, like pancakes, omelets, croutons, appetizers, tarts and pies, cakes, fruits and vegetables – pretty much anything. They come in two sizes, Standard (4 to 4-1/2” high) and Mini (not pictured - 1-1/4 to 1-1/2” high). We apologize - we are currently out of stock on the Standard size. We apologize - we are currently out of stock on the canning jar lids and do not expect to have additional stock for perhaps a month or so! Please e-mail us for availability. We often find ourselves paging through The Oregonian Cookbook seeking a new culinary treat. It's such a great resource. This month's recipe is one of the gems amongst the 360 recipes tucked inside the 18 chapters that comprise the volume. You might be tempted to dismiss the Savory Mushroom Strudel as something only to be served for an exceptional occasion. Instead, we recommend that you consider offering it now as an entree for you and the special one in your life. After all, shouldn't every meal with that person be out-of-the-ordinary? The strudel's a memorable choice for an intimate dinner for two. Just add a rich, festive red wine and a mixed greens salad with a light hazelnut dressing followed by a fresh fruit platter, and you've got a menu for a magical evening. The forestlands are currently offering a variety of delicious wild mushrooms that will bring a flavor punch to the preparation. Be daring: fill the strudel with a combination of Golden and White Chanterelles, Oysters, Boletes and perhaps a rehydrated Morel that you've been storing since the spring's bounty dictated that you bring out your dehydrator. Whatever combination of mushrooms you select, you won't be disappointed with the preparation. Massachusetts' Walden Pond (yes, THAT Walden! ).